The result of this constitutional assembly election could be decisive for the country΄s political future. The violence could intensify still further; there is even talk of a looming civil war.Picture the Venezuelan president as being like a striptease dancer, suggests the newspaper El Nacional. He strips off, piece by piece, until finally he΄s standing stark naked. When he casts aside the decorative accessory of democracy and the rule of law, one sees who the president really is: "a straightforward and vulgar dictator, of whom there have been so many in the sad history of Latin America." This newspaper, sympathetic to the opposition, is sarcastic in its description of Venezuela΄s socialist head of state, Nicolas Maduro. El Nacional΄s commentary doesn΄t hold back: The people in power are concerned above all with their personal well-being, it says, adding that this makes it even sadder that many Venezuelans are still convinced people in these circles are genuinely pursuing a socialist project to renew the country. This idea, says the paper, is simply wrong. 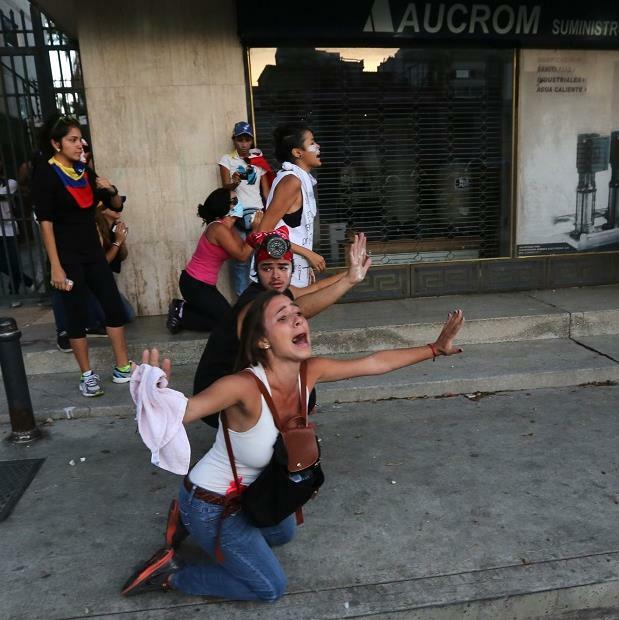 Maduro΄s opponents are showing corresponding determination. Despite a ban on demonstrations, they were already out on the streets last Thursday, protesting the election of the constituent assembly. There were bloody clashes in which several people were killed. Parliamentary president Freddy Guevara, a member of the protest movement, said Maduro should be given an ultimatum: Cancel the election, or there would be more protests. The decisive action by the demonstrators prompted the government to adopt a confident tone of its own. The Constituent Assembly to be elected was "one of the most democratic elements in the entire world," the president΄s legal advisor, Elvis Amoroso, asserted in the newspaper Ultimas Noticias. The new assembly, he said, would enable "that great dialog, the peace, harmony and forgiveness, for which all Venezuelans yearned." Sarcasms versus pathos: Both camps, President Maduro΄s followers and his opponents, used strong words to prepare their people for the election on Sunday. The opposition wanted people to boycott the vote, while the government was hoping for a high turnout. Maduro said the registered 19.4 million Venezuelans called on to cast their ballots were to settle a very important question, namely: whether they wanted to live in a "free country or in a colony of imperialism." The opposition alliance Mesa de la Unidad Democratica (MUD) takes a different view. It sees the election as one thing above all – an attempt by Maduro to strengthen his own position. The alliance points out that Maduro wants to fill the majority of the council΄s 545 elected seats with his own followers, or with people from groups sympathetic to the government – trade unionists, students, pensioners. Furthermore, all of the 364 municipal areas will be given equal weight. The opposition says this is unfair, as it means sparsely populated rural regions are significantly overrepresented compared to the big cities, which are much more heavily populated. Maduro recruits his supporters primarily from rural areas. This way he would get a clear majority in the elections, even though he now only has the support of around a third of the people. The opposition΄s fears are well-founded, Detlef Nolte, the director of the GIGA Institute of Latin America Studies tells DW. The elections do not meet democratic criteria, he says. A third of the candidates have been put forward by the government, and the opposition has also been left out in the cold as far as the other representatives are concerned. Sunday΄s vote was the "illusion of a free election", says Nolte. "There is a great danger that the government will reform the constitution in such a way that it never loses elections again." Claudia Zilla from the German Institute for International and Security Affairs (SWP) takes a similar view. "There is disagreement about when precisely Venezuela ceased to be a democracy," writes Zilla, who heads the SWP΄s Americas Research Division. She points to Maduro΄s "increasingly authoritarian exercise of power, such as the dismantling of the separation of powers, or the restriction of the freedoms of expression and assembly." In 2016, for example, the authorities cancelled two elective processes – a recall referendum on removing the president, and the upcoming regional elections. "The serious danger of defeat must have prompted the government to relinquish the last semblance of democracy," Zilla writes. The opposition called for a boycott of Sunday΄s elections. Despite the ban on demonstrations, it wanted its supporters to take their protest to the streets. Since April, around 100 people, including several police, have died in clashes between demonstrators and security forces. Maduro is doing little to deescalate the situation. In an interview with the Russian broadcaster Russia Today, he accused the United States of colluding with the opposition in trying to topple him. The country, he claimed, was determined to defend itself: "If Venezuela is divided, if the socialist revolution is forced to take up arms, we will fight again under a common flag beyond our national borders." Maduro has already armed 500,000 militiamen. The result of this election could be decisive for the country΄s political future. The violence could intensify still further; there is even talk of a looming civil war. Right now, the country still has a chance to prevent the worst. "Venezuela has pronounced dictatorial characteristics, but the opposition is still able to express its views, although there are opposition activists and dissidents who are in prison," says Detlef Nolte from the GIGA Institute in Hamburg. Nonetheless, he warns, "Venezuela is on the cusp of becoming a dictatorship."